Kyūshū (九州, Nine Provinces) or Kyushu is the third-largest island of Japan and most southwesterly of its four main islands. Its name refers to the nine ancient provinces (kuni) into which the island was divided. The mountainous island is composed of a series of volcanic ranges and contains the world’s largest active volcano, Mount Aso. The island is known for its subtropical vegetation and heavy precipitation. Major crops are rice, tea, tobacco, sweet potatoes, soy beans, fruits, and wheat. Kyushu has coal, zinc, and copper mines, and a concentration of heavy industry in the north: Kitakyushu, Fukuoka, and Omuta are major industrial centers. Historically, Kyushu’s proximity to China and South Korea made it a gateway for cultural, artistic, and religious influences from Asia and, later, for contact with the West. The founder of the Yamato Kingdom, and first emperor of Japan, Emperor Jimmu, originally established himself in southeastern Kyushu before moving to Nara on Honshu Island. In 1274, and in 1281, attempted Mongol invasions of Kyushu were repelled by typhoons, known as kamikaze, which destroyed the Mongol fleet. St. Francis Xavier introduced Christianity to Japan through Kyushu in 1549. Nagasaki, Kyushu’s chief port, was the first Japanese port to receive Western trade. Nagasaki was the site of the second atomic bomb blast, which effectively ended World War II on August 9, 1945. Kyushu (area: 14,177 sq mi; 35,719 sq km), is the third largest and the southernmost of Japan’s four major islands. It is bordered by the East China Sea on the west and the Pacific Ocean on the east, and separated from Shikoku by the Bungo Strait and from Honshu by the Shimonoseki Strait. The Kanmon Bridge and Tunnel, a railroad tunnel under Shimonoseki Strait and a bridge, link Kyushu with Honshu. The island is mainly of volcanic origin. Its mountainous interior rises to 5,886 ft (1,794 m) with Mount Kuju, the highest of its 23 peaks. The world’s largest active volcano, Mount Aso (5,885 ft; 1,591 m), is on Kyūshū. There are many other signs of tectonic activity, including numerous hot springs. The most famous of these are in Beppu, on the east shore, and around Mt. Aso, in central Kyūshū. One of Japan’s two space centers and four national parks, including Aso-Kuju, Kirishima-Yaku, and Unzen-Amakusa are located on Kyushu. The world’s 37th largest island by area, Kyūshū is smaller than Spitsbergen but larger than New Britain and Taiwan. By population (13,231,995 in 2006), it ranks 13th, having fewer inhabitants than Borneo or Sulawesi, but more than Salsette or Cuba. The Chikugo (88 mi; 142 km long), the island's longest river, waters an extensive rice-growing area in the northwest. Parts of Kyūshū have a subtropical climate, particularly Miyazaki and Kagoshima prefectures, and the island is known for its subtropical vegetation and heavy precipitation. Major crops are rice, tea, tobacco, sweet potatoes, soy beans, fruits, and wheat. Kyushu has coal, zinc, and copper mines, and raw silk is extensively produced. Heavy industry, including chemicals and metal processing, is concentrated in North Kyushu, near Japan's oldest coal field; Kitakyushu, Fukuoka, and Omuta are major industrial centers. Kyushu is noted for its porcelain (Satsuma and Hizen ware). The famous Imari ware was manufactured at the ancient town of Arita. By population, the largest city on the island is Fukuoka, with 1.4 million inhabitants; Fukuoka is a major business center with a large international airport as well as one of Japan’s five stock exchanges. Kitakyushu is a designated city and major center for heavy industries, with a population of slightly less than a million. Kumamoto and Kagoshima are the island’s third and fourth largest cities with over half a million people each. The Kyūshū Region (九州地方 kyūshū-chihō) consists of seven prefectures on Kyūshū, Fukuoka, Kagoshima, Kumamoto, Miyazaki, Nagasaki, Oita, and Saga, and Okinawa Prefecture to the south. 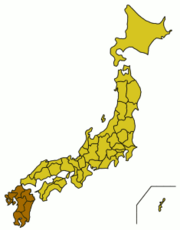 The name Kyūshū comes from the nine ancient provinces of Saikaidō situated on the island: Chikuzen, Chikugo, Hizen, Higo, Buzen, Bungo, Hyūga, Osumi, and Satsuma. 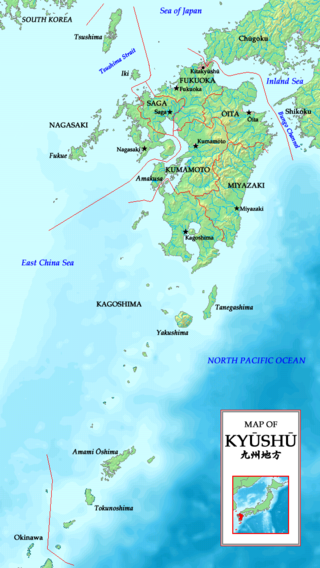 Other ancient names for Kyushu include Kyūkoku (九国 Nine States), Chinzei (鎮西 West of the Pacified Area), and Tsukushi-no-shima (筑紫島 Island of Tsukushi). The historical regional name Saikaidō (西海道 West Sea Circuit) referred to Kyūshū and its surrounding islands. Kyushu’s proximity to China and South Korea made it a gateway for cultural, artistic, and religious influences from Asia and, later, for contact with the West. The Yamato people began their northward movement from Hyuga, the present-day Miyazaki-ken Prefecture of southeastern Kyushu. According to Japanese mythology, Ninigi, a grandson of the sun goddess Amaterasu, first came to earth on Mt. Takachiho in Miyazaki-ken Prefecture. Amaterasu directed him to rule over Japan and invested him with the regalia of royalty: the sword (symbolizing courage), the mirror (symbolizing purity), and the jewels (symbolizing benevolence), which remain the Japanese imperial symbols. Okuninushi no Mikoto, who was already sovereign there, submitted to Ninigi when he was allowed to retain control of “secret” (religious) affairs. Okuninushi remains an important folk deity in Kyushu, while Ninigi is no longer venerated. Ninigi is said to be the great-grandfather of the first emperor, Jimmo, who formed an alliance with Queen Himiko of Kyushu, and drove back the barbarians in the mountainous hinterlands, before moving on to Honshu to establish the Yamato kingdom in Nara. A number of archaeological sites exist along the northern shores of Kyushu prefecture, including the Takehara Mound, whose central chamber is decorated with primitive drawings of men and mythical beasts; and Itokoku, where Japan's largest bronze mirror was excavated. In the late 1700s, on Shikano-shima, an island in the center of the Genkai Quasi National Park a farmer discovered a gold seal that corroborated early contact with the Han Dynasty of China. In 1274, Kublai Khan sent a Mongol and Korean army of 40,000 warriors to invade Kyushu. Mongols occupied a portion of Hizen province (part of present-day Saga prefecture) and had landed at Hakata when a terrible storm destroyed 200 of their ships and forced their retreat. The Japanese were better prepared for a second Mongol invasion of 100,000 warriors in 1281; again, a typhoon destroyed more than 200 ships of Kublai Khan’s fleet, and the survivors returned to Korea. The Japanese people believed that these typhoons, called kamikaze ("Divine Wind"), had been sent by the gods in answer to their prayers. Kyushu was a staging area for Toyotomi Hideyoshi’s invasion of the Korean mainland in the late sixteenth century. Korean ceramic artists who were brought back to Japan set up workshops in Saga, which became known for fine pottery, particularly around the towns of Arita and Imari. Japan's first recorded contact with the West also occurred near Kyushu in 1543, when three Portuguese merchants traveling in a Chinese junk were blown off course and landed at Tanega-shima, an island just off the tip of Kagoshima. St. Francis Xavier came to Japan through Kyushu in 1549, and began to spread Catholicism. In 1637, the Tokugawa shogunate, considering Christianity a direct threat to its sovereignty, killed 40,000 Catholics in a battle at Shimabara, a peninsula just east of Nagasaki. Japanese Christianity then went underground, until the reopening of Japan in the mid-1800s. Nagasaki, the chief port of Kyushu, was the first Japanese port to receive Western trade. When Japan isolated itself during the Tokugawa shogunate, Nagasaki was the only link to the outside world. Chinese, Korean, and Dutch merchants were sequestered on a tiny island, De Jima, linked to the mainland by a small bridge. Japanese students, intellectuals and artists received their earliest exposure to the West through the Dutch at De Jima. Nagasaki was the site of the second atomic bomb blast, which effectively ended World War II on August 9, 1945. Kyushu was the birthplace of several important political and military leaders who shaped the history of modern Japan. In the seventeenth century, Kyushu’s Shimazu clan subjugated Okinawa and expanded Japanese rule into the Pacific. Saigo Takamori (1827 – 1877), born into a samurai family in Kagoshima, was instrumental in bringing about the Meiji Restoration in 1868. Afterward, he rebelled against the new order and led the unsuccessful Satsuma Rebellion in 1877. Togo Heihachiro (1848 – 1934), also born in Kagoshima, was admiral of the Japanese Imperial Fleet that annihilated the Imperial Russian Baltic Fleet in the Russo-Japanese War of 1905. The genetic affiliation of the Japanese language is unknown. A popular theory suggests that people living in Kyushu during the Jomon era (7500 B.C.E. to c. 250 B.C.E.) spoke an Austronesian language, and that a southern Korean language was introduced along the southern shores of Kyushu along with the Yayoi culture. The influence of this language and culture gradually spread eastward, but did not completely supplant the older one. Its subtropical climate makes Kyushu a popular area for tourism year-round. In addition to sites of historical and archaeological interest, Kyushu offers a variety of natural attractions and hot spring resorts. Beppu, founded on April 1, 1924, is famous for its thousands of onsen (hot springs), which are regarded as sacred. Beppu has the largest volume of hot water in the world, second only to Yellowstone National Park in the U.S.A., and the largest number of hot spring sources in Japan. Beppu contains nine major geothermal hot spots, which are sometimes referred to as the "nine hells of Beppu," bubbling multicolored ponds that ooze from the active volcanic soil below, as white steam fills the air. Beppu is also divided into eight major hot spring areas, otherwise known as Beppu Hatto. Kome Zuka lies in the vast Aso caldera. Mount Aso (阿蘇山, Aso-san) is the largest active volcano in Japan, and is among the largest in the world. It stands in Kumamoto Prefecture, on the island of Kyūshū. Its peak is 1592 m above sea level. Its caldera is 25 km across north to south and 18 km across east to west. The caldera has a circumference of around 120 km (75 miles), although sources vary on the exact distance. ↑ Kujū-san, Japan Peakbagger.com. Retrieved June 26, 2012. ↑ "Nine Provinces" may also refer to Jiuzhou, a historical division of China. Datai, Tadashi. 2000. Asia, Kyushu, and tourism in the 21st century. Fukuoka, Japan: Asian-Pacific Center. Farrell, Bertrand P. 1981. The Dominican martyrs of Japan. Dublin: St. Martin de Porres Apostolate. Kyushu and Okinawa potters. 1993. Toh, v. 80. Kyoto: Kyoto Shoin. This page was last modified on 26 June 2012, at 22:44.